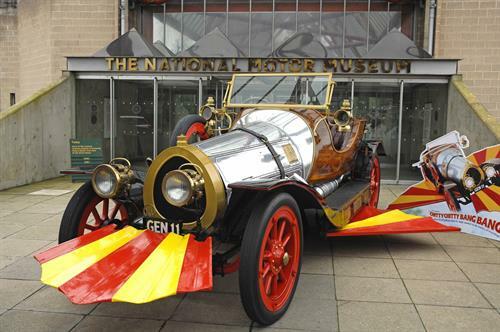 To celebrate the 50th Anniversary of one of the world’s favourite films the National Motor Museum at Beaulieu is to launch its Chitty Chitty Bang Bang 50 years exhibition from October 20th. The exhibition will tell the story of Chitty as the star of the fantasmagorical family adventure and feature an original screen Chitty Chitty Bang Bang. Coggins’ Garage will be recreated in the museum to house the amazingly inventive machines of Rowland Emett seen in the film. A timeline wall will chart the Chitty story from its beginnings – as James Bond creator Ian Fleming’s inspirational book about the magical flying car – to Cubby Broccoli’s unique interpretation on film. Weird and wonderful Chitty memorabilia includes signatures of the star-studded cast, pedal and Corgi cars, comics, computer games, pop-up books and even lunch boxes made to celebrate the children’s favourite film.